14k white gold four way medal is die struck with polished finish. Dimensions: 30x29mm. Weighs 5.87 grams. Please note: weight is approximate, actual weight may vary. Chain not included. 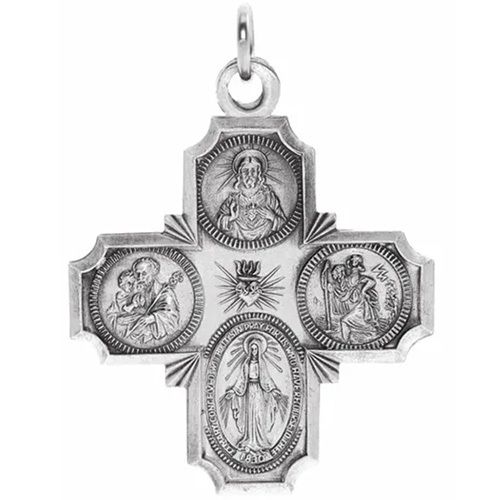 Also known as a cruciform, it is actually four medals in one: The Sacred Heart at the top; St. Christopher on the right; Miraculous at the bottom; and St. Joseph on the left. 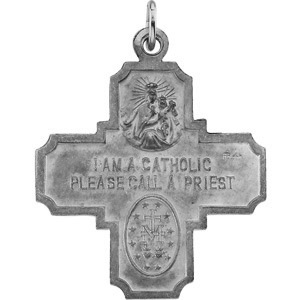 The words "I am a Catholic, please call a priest" are inscribed on the back to indicate to a first responder the wearer's desire for the last sacraments.